A program offered at a Virginia high school helps students reach out by teaching them to identify markers of emotional or mental distress and what to do when they see the signs. 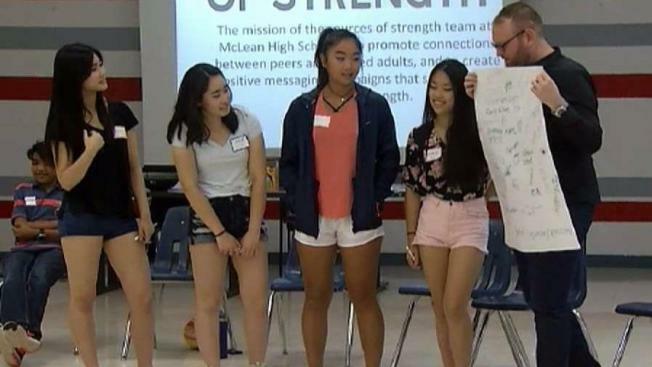 “The idea is that instead of talking about suicide prevention in terms of trauma or crisis, we talk about it in terms of strength and protective factors, and we use you all as our peer leaders,” said Sources of Strength trainer Bobby Donahoe. On a rare Friday off this fall, students participated in a class, which started with icebreakers and positive exercises so everyone could learn a little more about each other and themselves. 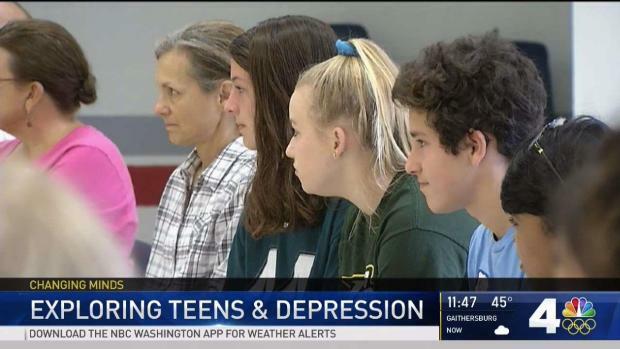 News4's Doreen Gentzler is continuing her dive into the topic of depression and anxiety among teenagers. Today, we are learning about Sources of Strength, a prevention program aimed to help kids identify signs of stress. The subjects soon become more intense. Donahoe asked the teenagers what stresses them and their friends out. “Eelationships can be tough, yes,” Donahoe said. “If someone came to you and they were telling you, ‘Hey, I'm have suicidal thoughts,’ you wouldn't be a positive friend if you kept that secret,” Donahoe said. Suicide is the leading cause of death for ages 15 to 24 in Virginia, and a recently, a 12-year-old in Fairfax, may have jumped over a railing in an attempt to kill himself. Sources of Strength not only encourages kids to speak up about their own feelings, it urges them to reach out to adults who can intervene and help with treatment. It teaches how to navigate that tricky line between being a caring, trustworthy friend and sounding the alarm. “I think that any time a friend is in danger, that they might do something to themselves, it's really important to let their families know,” one student said. Sources of Strength also encourages students to reach out if they need help. “It's better to go out and reach for help instead of keeping it inside of you having it kill you little by little, so that group in this school is one of the good ones,” Tatiana said.